The life as an artist always has it’s ups and downs. Luckily I have been very blessed and mostly experience the former but had my fair share of downs too during the twenty something years I have been painting. This painting which was featured in ARTension magazine is called The Two Bridges of Port Adelaide, South Australia and is in the private art collection of Rosalie and Kevin Zerk. When I found out I had been chosen together with 11 other naive artists from around the world to be featured in a French Art Magazine called ARTension I was thrilled of course. What had led up to this was my inclusion in the Art Naif Festival in Katowice, Poland 2011 where some 190 naive artists from all over the world had been invited to exhibit. This in turn led on to another invitation to take part in the Henri Rousseau exhibition which was held in the Abbey of Montivilliers in Normandy, France in January and February 2012. These exhibitions as well as this year’s Naive Art Festival in Katowice, Poland 2012, has all been made possible by the wonderful Jacques Dubois, who eats, sleeps and breathes Naive Art! 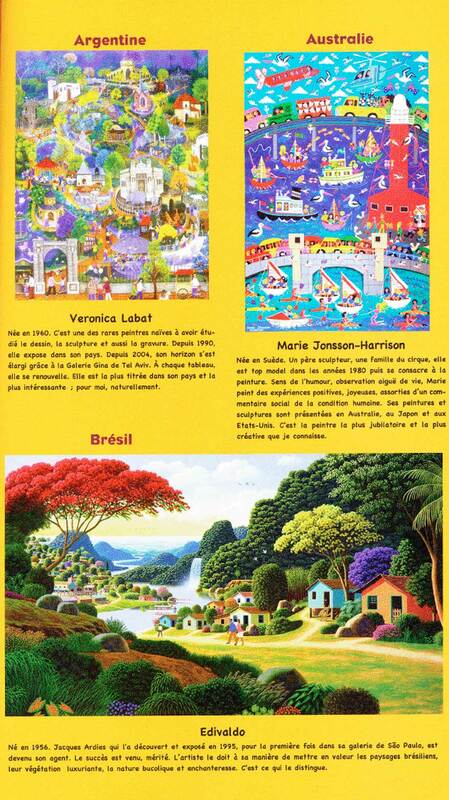 So here is the article about the 12 naive artists and keep in mind that the pages have been translated from French to English so there are a few problems with the grammar, but that adds a little French charm, no? For six years, Jacques Dubois has abandoned his original trade of business to devote himself to painting he loves, and his wife practice. 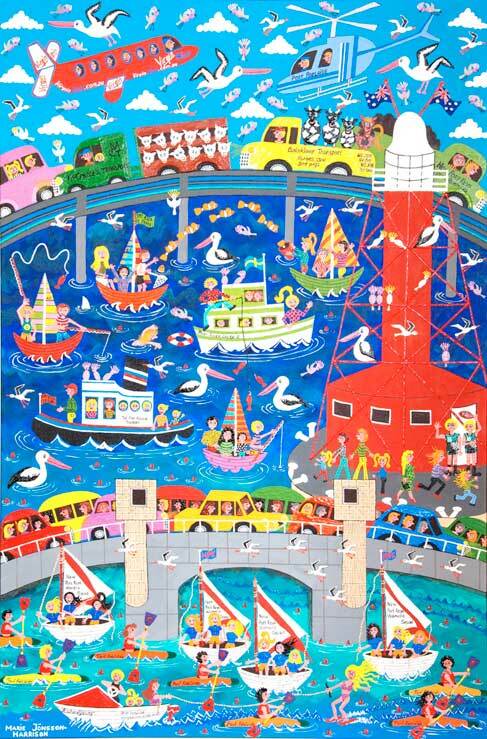 Creator of the World Festival of Naive Art in Verneuil-sur-Avre in 2005, he moved to Katowice, Poland, five years later.He presents the naive current world, convinced that this art still has a bright future ahead of him. We asked him to introduce his recent twelve strokes of heart. Olaf is currently the most talented of the few German naive. Its uniqueness, its trademark, it is twilight, in a German village on the Rhine. It uses a marine varnish to enhance its color. A sculptor father, a circus family, she is top model in the 1980s and devoted himself to painting. Sense of humor, acute observation of life, Mary painted cheerful and positive experiences, accompanied by a social commentary of the human condition. His paintings and sculptures are presented in Australia, Japan and the United States. This is the painter’s most exhilarating and most creative. Born in 1956. Jacques is Ardies who exhibited in 1995, for the first time in his gallery in Sao Paulo and who became his agent. Its deserved success he owes only to the development of Brazilian landscapes with lush vegetation and bucolic nature and enchanting. This is what distinguishes it from all other painters Naïve. Installed in Ivory Coast for many years, he developed an “African naïve art” in his own words. His descriptions of daily life are as much of a dream than reality. Surrealism is not far. One of the best contemporary painters in Africa. Currently in their forties, he still has a bright future ahead of him ^ and full of ideas of tables in the head. Born in 1956 in Havana. He lives with his mother in the suburbs of Havana. In his neighborhood, he was immured to escape the noise and Salsa. He paints his dreamlike paintings while listening to baroque music of the eighteenth century. Obviously, his neighbors are crazy. Amahoro gallery of St Martin in the Caribbean defends his work very creative. Born into an artistic family, she has been painting since 1977 and many European museums possess his works. Based in Barcelona, ​​she made prints in the studio Artcontraprova and teaches visual arts at the Foundation for the Arts Hervás Amezcua. This is goodness personified, and his paintings emit an enormous amount of things certainly because of the flat technique perfectly mastered. A graduate of the School of Visual Arts in Jerusalem in 1992, he lives in Tel Aviv where he painted landscapes and couples.Despite its “youth” Rafi is one of the most talented of his country and handles very large formats with ease that commands respect. It is the best representative of the current Art Tingatinga, invented by Edward Tinga Tinga, who is becoming known throughout the world and gives local artists the opportunity to live their art. Audience Award at the 2011 World Festival in Katowice, he will appear this year. Just reward for this humble artist, who paints for sixteen years. The French association Tinga is African-charge of its promotion. Former pupil of the sculptor Turgut Pura at the State Museum of Painting and Sculpture in Izmir, then Cavit Seref Bigali Atmaca and the Department of Painting Education Institution, she has since won numerous Awards of naive painting and often exhibited in different countries. His landscapes are particularly noteworthy. in 1942, the grandpa of Naive Art is still the most inventive today. But looking at his paintings and retailer, it must be quite a prankster. His favorite themes are the urban landscapes such as Amsterdam, where he is particularly fond of representing ports and major facades of Dutch houses. He also painted the interiors of these houses with precisely these landscapes through windows. It’s great art. Born in 1960 she still lives in his country Argentina. This is one of the few painters have Naives to study drawing, sculpture and also engraving. Since 1990 she exhibited nationally since 2004 but that its course becomes truly professional with the gallery GINA Gallery Tel Aviv. At each table, but it is renewed crunches always living in Argentina. The most successful in his country and most interesting, for me, naturally. I urge you all to Google these artists and have a look at their fabulous work!